Ugh, leaving day. Always hate the last day of a WDW trip, no matter its length. It's just so demoralizing. But I've given myself the wonderful guarantee of being registered for two more runDisney races in the future! 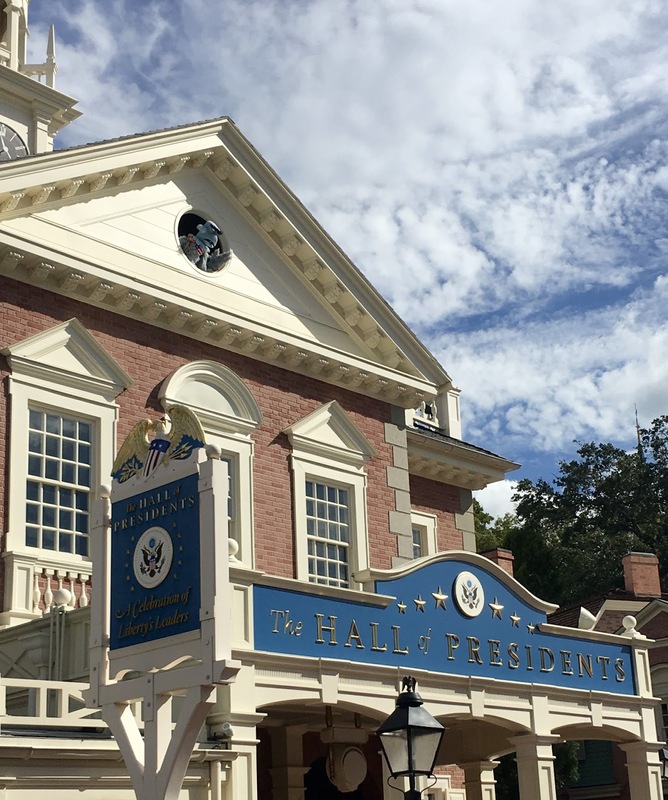 I was at least able to comfort myself with that promise as I woke, performed my morning ablutions, checked my carry-on at luggage assistance, and hopped a bus to the Magic Kingdom. Said bus took a bit to show (not my luckiest trip for bus catching), but I was still through the gates in plenty of time to catch my Space Mountain Fastpass. That done, I intended to take a spin on the Peoplemover, but there was a Cast Member holding the line for some reason. I proceeded directly to make Haunted Mansion FP instead. It was a remarkable trip only in that I was at no point stopped by playful spirits. Also, I swear I heard Little Leota tell me to bring my birth certificate if I decided to join her. Am I going insane or did they actually make that switch? I came out of HM just in time to catch a showing of the new Great Moments in History with the Muppets. I understand that there are two shows, and this was the one about the Declaration of Independence. I found it to be classic Muppets - some okay jokes, a few hilarious jokes, but mostly jokes that are so bad they circle right back around to amazing. 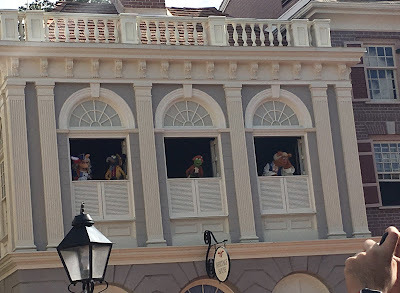 Mostly I was just pleased to see my favorite Muppet, Sam Eagle. I am Sam Eagle and these are some important safety instructions. I decided to walk back to Tomorrowland next, where I was pleased to see the Lunching Pad had opened an hour early. 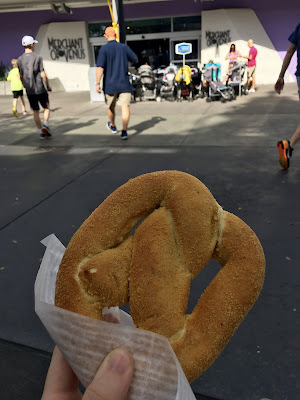 I made breakfast out of my very first cream cheese pretzel, a storied snack which I found quite pleasant but not necessarily get-it-every-trip worthy. Now, if Disney wants to start selling a pretzel stuffed with straight-up cream cheese frosting, I'll buy six. If you prick a sweet cream cheese pretzel, does it not bleed sweet cream cheese? If you eat it, does it not revenge? While I was in the area I decided to take in the Carousel of Progress; not sure if I'd done it since, say, 2011, maybe? Obviously it's quite dated, especially in that final scene, but it's eminently quotable and ultimately charming. I dig that their dog is immortal. Where can I get one of my own? By this point my Splash Mountain FP had opened up; I took a satisfactual spin while learning first hand that holding your Minnie ears onto your head while simultaneously attempting to pose for the drop camera is an art I need to study and refine. WDW power user moment: I snagged a Pirates FP while still actively on Splash. On the way out I was chased down by a CM who loved my Cheshire Cat dress. 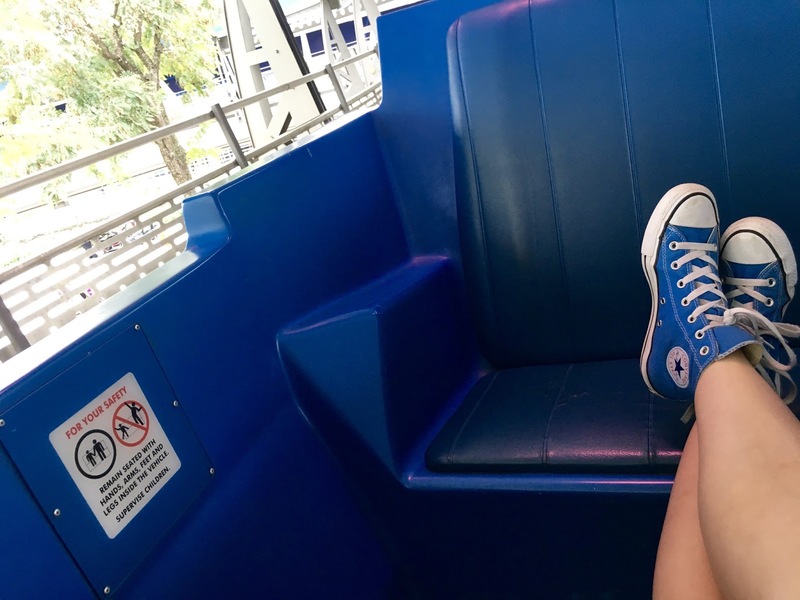 Here's my recent philosophy on dressing for the parks: obviously, comfort is paramount. However, my first adult trip to WDW I decided it didn't matter how I looked because I'd be in WDW; who cares? And to a degree I was totally right, and if that's your M.O., have at it. However, I pretty much across the board hate all photos of me from that trip. Therefore I now try to dress up a little, slap on some makeup. Not, like, ballgowns and heels or anything completely unhinged, but something a little cute and Disney-ish. Call it vanity, call it Disneybounding, call it approximately 10 compliments on my Little Mermaid dress, 4ish for the Cheshire Cat, one for my blue Chucks, and none at all for my Eeyore shirt and tutu. Hold on to your hats because this is - believe it or not! - about to become a plot point. Before we get there, though, I should note that I took in a showing of the Country Bears. It is absolutely insanity, total absurdity, and I love it for that. I can see it being a divisive attraction for those reasons, however. Anyway, any blood on saddles aside, my Pirates of the Caribbean FP window opened and I took my place in line. There was a little girl behind me who kept asking her parents if the ride would be scary, but despite their reassurances she remained worried. Suddenly she turned to me and told me my dress was pretty - and then turned to her dad and told him that she had told me that my dress was pretty. This apparently cheered her up enormously, and her parents noted that my dress had cured her fear. Magic! I wound up in a boat with her, and she would periodically twist around and wave at me; at one point I swear she told me I was "very brave." Our brief but intense friendship ended with a final wave as we parted ways in the post-ride gift shop. The Cheshire Cat: he brings people together. I was out of immediate plans; I fired up MDE but didn't find any FP slots to my liking. Instead I picked up a bus to Epcot for my final foray into the Food & Wine Festival. I'm lucky that was my main goal because there were NO FPs worth having available at any point during my time there and lines were pretty long. The Chew was my first kiosk stop, where I got a peanut mousse that was very enjoyable, although I personally could've done without the added crushed peanuts. I also grabbed another Shipyard milk stout, the only thing I got twice during the festival, simply because I enjoyed it so much. I need to find a milk stout in my area. I got in line for France, thinking I'd get some escargot, but my culinary interests took a left turn; I went and got some hummus fries from Morocco instead. They were subtly different from falafel and came with a spicy sauce I enjoyed. After a failed attempt at the Test Track single rider line (even that was long), I went back to F&W for a red wine truffle. It wasn't particularly red-wine-y as far as my tastebuds could discern, but I was fairly tired by that point so my brain might not have be syncing properly with my tongue. I chilled for a bit in the fake grass by the future foods kiosks before suddenly realizing I'd almost forgotten to get Pat some caramels from Karamell-Kuche or however you spell it. I trekked over to Germany and stood in what I must say is kind of a ridiculous line for a food stall. It took like twenty minutes to get one chocolate-covered caramel square. But Pat liked it so it was worth the time. As I walked back from that venture I came upon people sitting in wait for the Jeweled Dragon Acrobats in China. 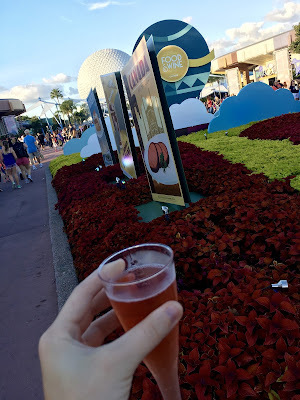 I picked up a Ritzy Lychee drink from the China kiosk (holy alcohol, Batman; if you complain about light pours at WDW, get this and be soothed) and plunked myself down on a stone bench behind the show. The show was pretty underwhelming but the fifteen minutes of sitting with my legs elevated made a world of difference in my morale. If you ever know I'm a WDW, tweet at me that I should sit down for awhile. No matter when, no matter what I'm doing, you're probably right. I caught Mariachi Cobre on the way out of World Showcase, then picked up a celebratory glass of rose champagne from the Desserts & Champagne booth as I slowly made my way out of the park. 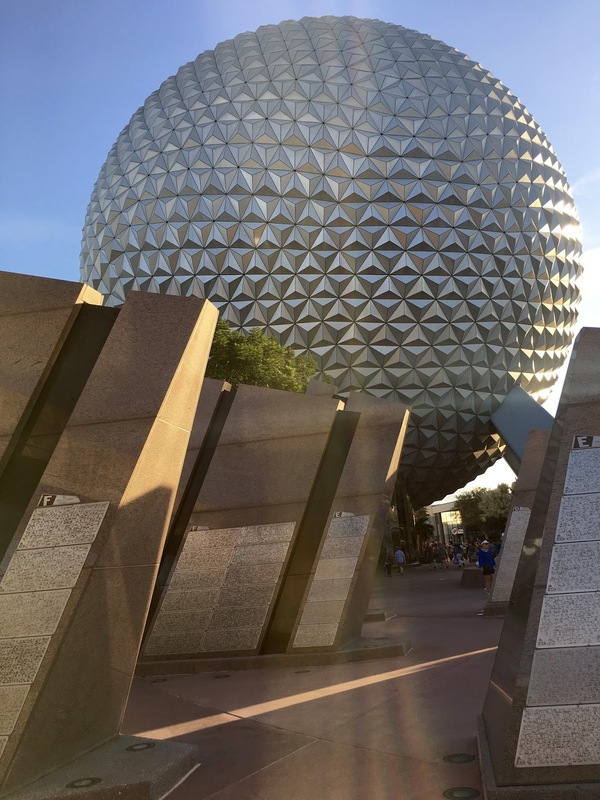 It was a sweet, sad thing, sipping the remains of my sparkling wine, gazing at Spaceship Earth, saying goodbye but also see you real soon. I caught a bus to Pop and arrived over an hour ahead of my Magical Expres bus; I killed some time at the pool bar before leaving, slightly sloshed and very sad, for the airport. And that's more or less it - but not quite. 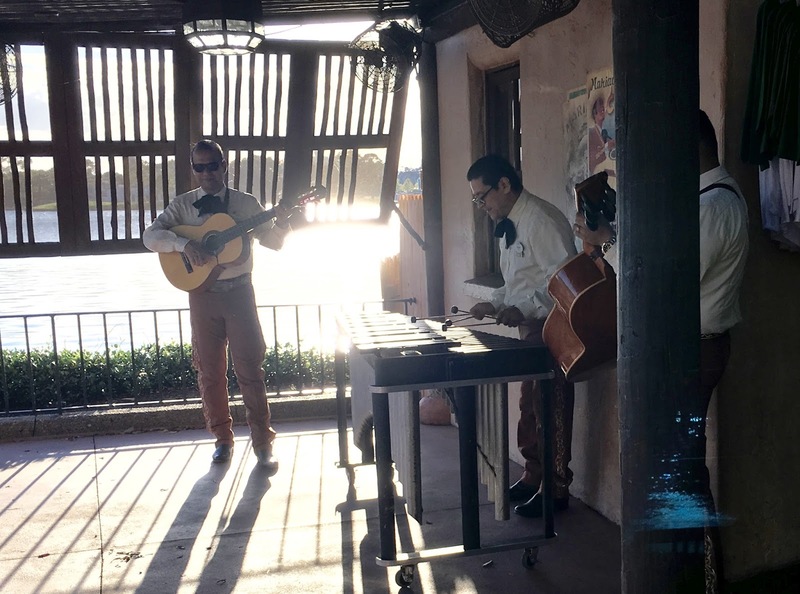 I still have reviews of my wine tasting experience and Nomad Lounge. Stay tuned! "If you have to leave, at least leave sloshed." Mission: accomplished! That Ritzy Lychee in particular is no joke. Ritzy thingie on next trip. Check!